INTRODUCTION: "The Edge of the World" is a joint co-review by Cindy Hannikman and Liviu Suciu so we will have two takes on it in the Analysis part. Kevin J. Anderson, while well known for his work in shared universes like Dune and Star Wars has come to my attention with the science fiction Seven Suns saga which was quite an enjoyable fast paced old-fashioned "golden-age" like space opera with every sf trope thrown in for good measure. And it worked for me so I keep recommending it to this day to people looking for a good introduction to large scale sf, since it is very accessible and clearly written, while also exhibiting the sense of wonder that attracted me to sf many years ago. True, it went a little bit too long for its depth and its sense of wonder soon became somewhat diluted while the characters could not truly pick up the slack, but the first 4 volumes at least were just great fun. So when Mr. Anderson announced that he will write an epic fantasy trilogy with the appropriate tropes, so sail-ships and swords instead of spaceships and guns, I was very excited and had high expectations for an entertaining and page turning novel. And I have to say that "The Edge of The World" exceeded my expectations, being a book that hooked me on first page and I could not put down till the end, while the next installments are asap novels. OVERVIEW: The known world consists of a huge North-South landmass joined by a narrow isthmus on which the Holy City of Ishalem stands. The northern continent Tierra, consisting of several semi-independent provinces and ruled by King Korastine from his capital at Calay is the land mythically settled by Aiden, who is worshiped now in the Church of his name and has clear similarities with medieval Christendom. The Tierrans are famous merchants and seamen. Tierra is also the home of most Saedrans, famous mapmakers and indispensable navigators who occupy positions of power and respect despite their different religion. So a somewhat tolerant Christendom analogue. The southern continent Uraba led by the peaceful, but tired Soldan Shah Imir and his heir Omra is the land of Urec, the brother of Aiden. Urec's priesthood the Ur-Sikara is all female, but other than that, there are marked similarities between Uraba and medieval Islam, including bazaars, harems and harem politics. The Seadrans are less prominent than in Tierra since the Urabans are less inclined to undertake long sea voyages. However, while Tierra ends in a sub-polar like region which is essentially a frozen wasteland, Uraba ends at the edge of a desert and there are rumours of people living beyond it. At the start of the novel there is an uneasy peace between the two countries, but when greed and misunderstandings lead to small scale hostilities, the two leaders Korastine and Imir agree to meet in the commonly held Ishalem to sign a perpetual peace including an edict dividing all the world in spheres of influence based on latitude. With the help of the Seadrans Guild, king Korastine also plans an expedition of discovery into the unknown Oceansea where the mythical sea monsters are supposed to live and commisions the ship Luminara to undertake it. Criston is a talented seaman who leaves his young wife Adrea and her younger brother in charge of their fishing business in a small coastal village and goes to Calay to enlist on Luminara for fame and fortune. Mateo is a young ward of Korastine and close friend of the young Princess Anjine, heir to Tierra, who plans to be a soldier like his dead father. Hannes is an Aidenist prester who is asigned to live as an observer among the Urabans to observe their culture. Aldo is a young Saedran who wants to become a famous mapmaker as his father. "The Edge of the World" stands at almost 600 pages and it is divided into 126 chapters, each told from the POV of one of the main characters, Criston, Adrea, Aldo, Omra, Anjine, Mateo, Hannes, Imir as well as from the POV of several less prominent ones. There are several maps at the beggining of the novel, a glossary of names and places at the end and an interview with the author as well as an extract from the next installment of the trilogy. Note that the Glossary contains some notable spoilers as I found out to my surprise, so I recommend to avoid it at least for the first 200 or so pages. The multiple threads of the novel weave very nicely, there are several unexpcted twists and turns and the ending is essentially where the next novel will start. No particular cliffhangers, but no true resolutions either. (Liviu's Take) Fast moving, engrossing, clear prose and great characters you learn to care about. This is how "The Edge of World" read to me and despite its length I finished it quite quickly since it's a very easy read. However this does not mean straightforward, since the novel twists and turns in quite unexpected directions and when you think you have an idea where it goes next, you are soon confounded. Also the novel takes place across quite an extended period of time, so we see characters change, grow, children become adults, babies become teenagers and that adds a lot to the depth of the novel in contrast to many series that compress a lifetime worth of events in a short period. Reading the Glossary early in the novel I found out about one of the major twists and about a character that becomes quite important later on, and that is a reason to avoid doing that at least for a while. Despite its name, the novel is not a maritime one, most action takes place in palaces, cities and other land based places, though map-making, exploration and voyages of discovery always hover in the background. While saying that hot air balloons play as important a role in the story as ships is an exaggeration, the fact that we can compare the two illustrates the point above. If you start liking a character a lot, be aware, since Mr. Anderson tends to put them through trials and tribulations that change them and their circumstances a lot, another big plus in my opinion. Comparing with the "Seven Suns" saga with which this novel shares quite a lot of themes and character sketches, I have to say that the "limited expanse" of the Tierra/Uraba world actually focuses the novel much better, than the sprawling galactic action in "Seven Suns", and while the sense of wonder of the latter is much less seen here, the characters are more interesting, more developed than the somewhat steoretyped ones in "Seven Suns". So I would say that on the whole "The Edge of the World" is the superior book unless you look only for sense of wonder and unlimited vistas, where "Seven Suns" excels. "The Edge of the World" was a positive surprise not in that I liked it a lot, which I expected based on my prior experience with "Seven Suns", but in that it is a deeper novel, one that re-reads much better, with characters I really care about and want to see their fates in the next volumes which became true asap's for me. Highly, highly recommended and a notable 2009 fantasy novel for me. 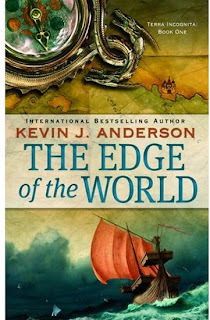 (Cindy's Take) I had never read any of Kevin Anderson's previous works before picking up "The Edge of the World". The idea of a fantasy debut really attracted me and I wasn't disappointed in what I read. While not the normal fantasy that I'm usually drawn to there were plenty of surprises throughout my reading that pulled me in from the beginning. I found "The Edge of the World" a very quick read. Mostly because I was anxious to see what would happen to a character, and it was very easy to get drawn into the universe that Anderson created. Several elements made this novel a great read. First, there is the depth of the world and characters. Anderson does such a wonderful job of establishing characters, traditions and religions that it's hard not to get pulled in and believe that you are part of this word. There are good characters and bad characters, some people will love instantly and some that take time to grow on readers. This could be attributed to the fact that this novel covers such a huge amount of time, as Liviu mentioned, that you practically grow up with the characters. However, Anderson doesn't drag things out during the novel. There's just the right amount of details to catch readers. The second element that pulled me in was the whole idea of expanding the world. I was intrigued with the expansion of the world and how the nations dealt with exploring new territories. It'll be an interesting concept that I look forward to seeing how it expands in the other novels. Another plus of the novel is characters and rulers have real life issues. No one is safe in this book, readers aren't going to encounter that squeaky clean character that does everything right all the time. Instead, the characters think about actions and have to deal with issues across the board. Lastly, the set up of the novel in that it has both sides of the conflict bring the book to a whole. Readers are presented with both sides and while from an outside point we see what causes a certain conflict, Anderson shows how both sides can misconstrue a certain action and take it upon themselves to seek revenge or hold it against the other nation. This was a creative way of portraying the plots in the story, and definitely brings a sense of closeness to this reading experience. In the end, I really enjoyed "The Edge of the World" and look forward to the rest of the novels in the trilogy. It's a book that I would recommend to any fantasy fan or even those that aren't so much into magic but love to read about different worlds or cultures. This novel definitely caught my attention as a worthwhile quick read. There's great characters, world development and of course great writing. As it's unpredictable it'll be fun to see where Anderson takes this series and I can't wait to read the next installment. I just spent my book budget for June. I must be a strange guy indeed, because I like Kevin Anderson´s novels since Assemblers of Infinity! I loved the Dune sequels/prequels (still loving them), and now I´m going to plunge deep into Seven Suns - and, yes, I´m going to read The Edge of the World (excellent review, Cindy, Liviu). OMG you guys do the best book reviews! Love your viewpoints and really appreciate the time you take to point out the good and the bad. Thankyou mos def an inspirtaion! It was a very excellent fantasy. Unlike Liviu I had never read any KJA before so it was a very big surprise that I enjoyed it as much as I did. Thank you for the very nice comments Chilli. Glad to hear that you enjoyed the review, there should be a few more Dual reviews coming along. I am reading this book and will finish it. However, I do not like this book as much as you. The whole political warring thing is annoying me. However, when he talk about ships and the sea creatures, I really enjoy it. The world building is well done but I find it a bit too political for my taste. Your review is excellent. I recommend this blog to many people who love this genre. The Edge of the World is the first of a three book saga that offers a complex blend of exploration, clashing cultures and religions, fanaticism, ill-fated love, and of course sea monsters. As always the author's clear and concise writing style keeps you flipping page after page, as the story unfolds a t a rapid pace, sweeping you away through the various currents of the many characters lives as we watch them try to cope with a quickly changing, turbulent environment that sets the stage for the next installment. I found it quite weak, with the two different groups just thin monoculture with all the effort in showing the evils of religion.